Built for the weekend escape. Clean, modern and sleek. The exterior of RAV4 Platinum is designed to reflect your personal style. The front-, rear, and lower-side trim and fenders are painted the same color as the body—adding a subtle sophistication that beautifully complements any getaway. See and be seen with available integrated fog lights and available LED lighting–including headlights, taillights and Daytime Running Lights (DRL). Now you can help make the road ahead even brighter. It’s the details that make all the difference. 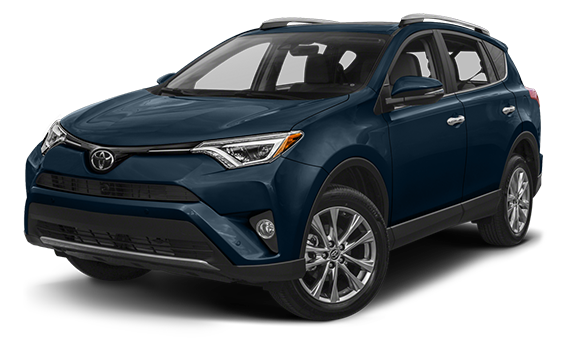 RAV4 SE is available with the S-Code paint treatment.1 Silver-painted accents are added on the front and rear bumpers, side lower trim and fenders. Such perfectly placed touches help give RAV4 a refined style all its own. Each RAV4 grade comes with a wheel designed to match its distinct personality. LE comes with 17-in. steel wheels with wide-vented spokes, while XLE Hybrid comes with stylish 17-in. alloy wheels. Limited features 18-in. alloy wheels with SuperChrome finish, and SE comes with sporty 18-in. machined alloy wheels—each with their own signature look. Leave a lasting impression, no matter which RAV4 you choose. RAV4 helps you customize your comfort. Available multi-stage heated SofTex®-trimmed front seats help tame those chilly nights. You can also relax on the longest road trips with available power-adjustable front seats with deep, supportive bolsters and useful seatback pockets. Now you can get more comfort and convenience from every trip. A smart way to stay connected and see things more clearly. With available integrated HomeLink®1 you can easily control your garage door, front gate and home security system from inside your RAV4. Add the available power tilt/slide moonroof and let the great outdoors in. And when the sun gets to be too much, just slide the sunshade closed to keep your cool as you carry on. Stay focused on the drive. Siri® Eyes Free6 helps connect the voice recognition technology8 of your paired iPhone®7 to RAV4. Send messages, listen to music, and get directions and more, all with the sound of your voice. With SiriusXM® Satellite Radio4 you can enjoy over 150 channels of coast-to-coast coverage, including commercial-free music plus the best sports, comedy and more. SiriusXM® Satellite Radio-equipped Toyota vehicles come with a 3-month complimentary trial of the SiriusXM All Access package. 1 HomeLink® and the HomeLink® house icon are registered trademarks of Gentex Corporation. 3 Be sure to obey traffic regulations and maintain awareness of road and traffic conditions at all times. Apps/services vary by phone/carrier; functionality depends on many factors. Select apps use large amounts of data; you are responsible for charges. Apps and services subject to change. See toyota.com/entune for details. 4 SiriusXM® services require a subscription after 3-month trial period. Subscriptions governed by SiriusXM® Customer Agreement available at www.siriusxm.com. If you decide to continue your SiriusXM® service at the end of your complimentary trial, the plan you choose will automatically renew and bill at then-current rates until you call 1-866-635-2349 to cancel. Fees and programming subject to change. Available only to those at least 18 years of age in the 48 contiguous United States and D.C.
5 Be sure to obey traffic regulations and maintain awareness of road and traffic conditions at all times. Apps/services vary by phone/carrier; functionality depends on many factors. Select apps use large amounts of data; you are responsible for charges. Apps and services subject to change. Availability and accuracy of the information provided by Scout® GPS Link is dependent upon many factors. Use common sense when relying on information provided. Services and programming subject to change. Services not available in every city or roadway. See toyota.com/entune for details. Scout® is a registered trademark of Telenav, Inc.
6 Always drive safely, obey traffic laws and focus on the road while driving. Siri® is available only on iPhone® 4S or later, iPad® with Retina display, iPad mini™, and iPod® touch (5th generation) and requires Internet access. Siri® functionality and commands are not accessible in the vehicle. Data charges may apply. See apple.com and phone carrier for details. Siri® is a registered trademark of Apple Inc.
7 iPod®, iPhone® and App Store are registered trademarks of Apple Inc. All rights reserved. It’s time to get off the beaten path and discover more good times with the new RAV4 Adventure grade. Hearty 18-in. 5-spoke Black alloy wheels, larger overfender flares and durable rocker panel guards all come standard, ready to help you take on any trip. When it’s time to get away, standard integrated black roof rails help you bring your gear along for the ride. No matter where you want to go, RAV4 Adventure grade’s unique badging, black-accented power heated mirrors and halogen projector-beam headlights with black bezels will get you there in style. Smooth out the rough edges when you’re roughing it. Take hold of the rich, leather-wrapped steering wheel and leather-trimmed shift lever, and treat yourself to a premium experience. You’ll enjoy every getaway with power-adjustable driver’s and front passenger seats featuring durable fabric trim and supportive sport bolsters. Thoughtful touches like metallic Adventure-badged doorsill protectors will announce your adventurous intentions, while unique accents add the perfect dash of style to your next escape. Built to handle the road less traveled. RAV4 Adventure grade’s increased ride height will help you clear more obstacles so you can reach more of what’s out there. Enjoy more style and greater capability with 18-in. 5-spoke Black alloy wheels and conquer more than the commute. You won’t even sweat the rough stuff thanks to the lower valance panels and available unique Adventure grade mudguards. RAV4 Adventure grade will show everyone that you’re ready to push the limits. Bring more of what matters along for the ride. Thanks to RAV4 Adventure grade’s unique Tow Prep Package you can tow1 up to 3500 lbs. With the upgraded radiator, supplemental engine oil cooler and transmission fluid cooler you can tackle the longest hauls with ease. Go ahead, hitch it up: RAV4 Adventure grade can take it. Go beyond the boundaries. Thanks to the heavy-duty Adventure grade all-weather floor liners and cargo mats, 2 you can bring some of the great outdoors back inside without worry. With the available 120V/100W power outlet in the rear cargo area, you can power up your gear no matter how far off the grid your adventure takes you. 2 This floor mat was designed specifically for use in your model and model year vehicle and SHOULD NOT be used in any other vehicle. To avoid potential interference with pedal operation, each mat must be secured with its fasteners. Do not install a floor mat on top of an existing floor mat. ^2018 EPA-estimated mileage. Actual mileage will vary.